I did a revamp on my spare set of carbs over the winter. 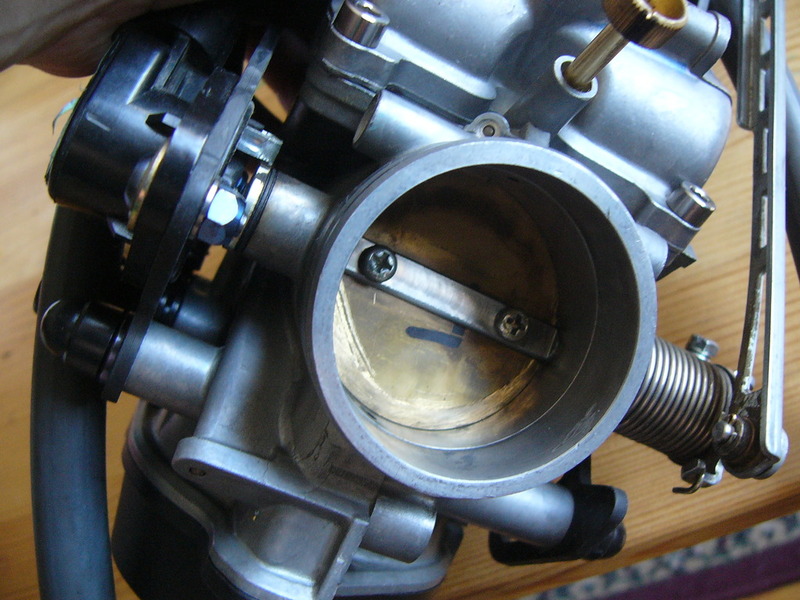 As some of you may recall, I had a set of Factory Pro High Dispersal Jet (HDJ) needle jets installed in my carbs last fall. I also got my hands on a carbon copy of the stock steel support plates and installed those (together with aluminum through bolts to further cut weight). 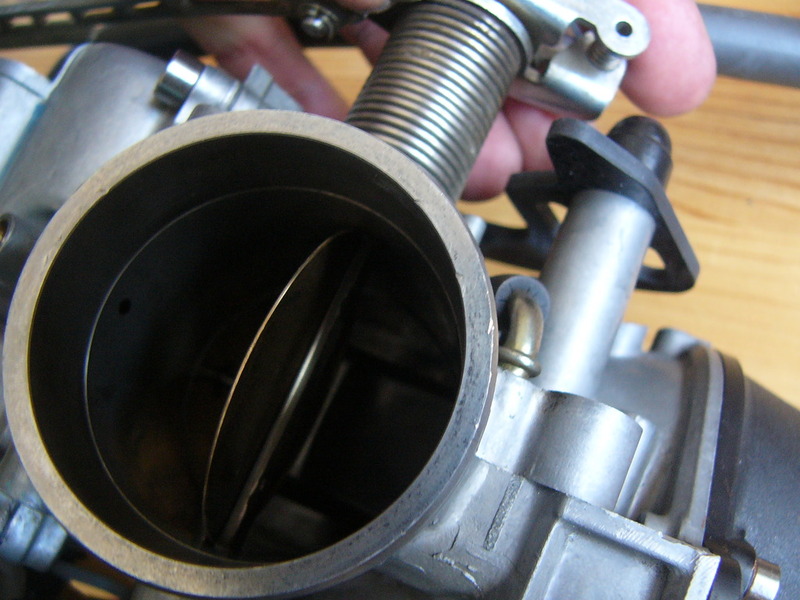 I also removed all hardware used for the heated carb lines (never used that feature, so off it comes). I did some reading about folks "streamlining: and knife-edging butterflies and, after raising the issue with Roger D, decided to proceed (see pics). I knife-edged the leading edge of the butterflies (so as not to upset the idling) and ground down the excess thread from the small screws (installed them with red Loctite to make sure they don't move and fall into the engine). All the external screws have been replaced with Ti too. 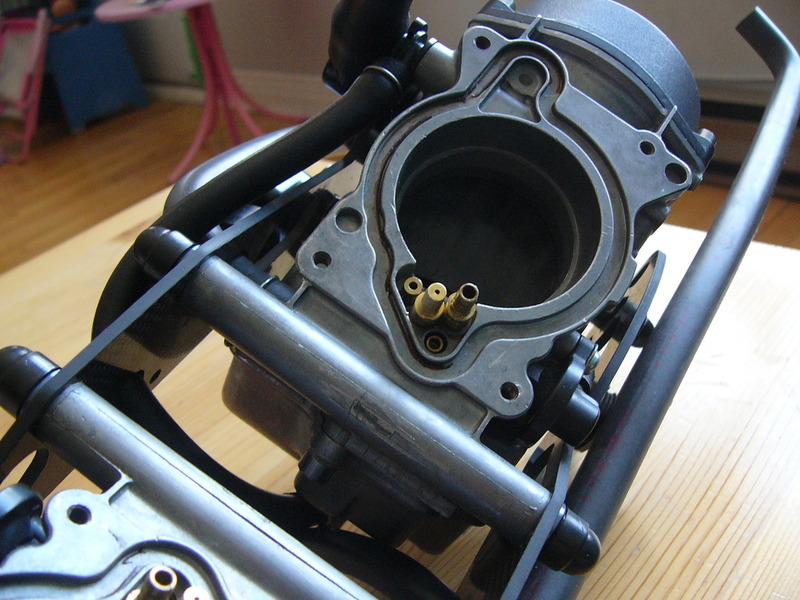 Finally, I put the dremmel to the rubber manifold that connects the carbs to the port and matched it up perfectly to the carb body. You will also notice that there are fittings to hook up 2 Flo-Commanders. 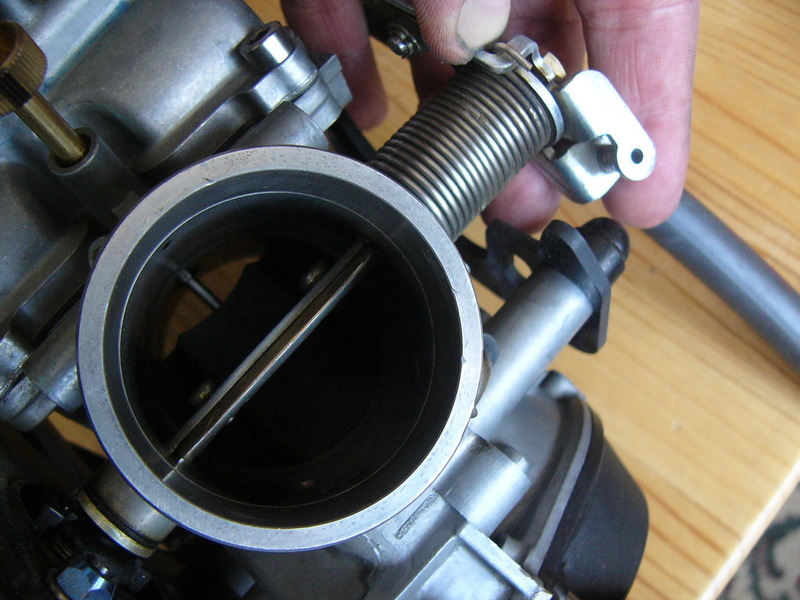 The pilot air circuit is standard stuff, but the main air jet circuit was modified by Factory Pro while installing the HDJ, they removed the stock brass fitting and tapped the hole to accept difference main air jet sizes. I had some custom fittings made (thanks to my buddy Jack Flash who hooked me up with a machinist) which allow me to change the MAJ jet but still use my F-C (MAJs on now are 100s, so 1.0mm). This will allow me to keep using both Flo-Commanders, giving me a great deal more flexibility when it comes to tuning. The goal, as always was to drop weight and optimize everything (in case air flow and hence power). Last edited by mikstr; 04-03-2015 at 06:32 PM. I'm stoked! Good luck. How soon to the dyno results? My goal is to get it pretty close to sorted, then bring the bike in for a valve adjustment and dyno calibration. Should be within the next couple months (still not riding season here). I am pursuing my `H-wing` experiment too (seemed to work really well last year, hopefully will work even better now). Last edited by mikstr; 04-03-2015 at 07:03 PM. Awesome, just awesome Micky! I can't wait to see the results. I knife edged my butterflies as well. Couldn't think of another way to mount the butterflies without those large phillips head fasteners. I was thinking of a rivit, but just didn't trust a rivit in that particular spot. I've had rivits come loose with past projects. Last edited by CruxGNZ; 04-03-2015 at 08:32 PM. I used to own and tune some pretty well modified quads. One of the little things i did was round the leading edge of the butterfly, and knife edge the trailing edge, so it was like an airplane wing, for optimum aerodynamics. I also used to remove one side of the shaft, and i countersunk the holes and mounted loctited countersunk hex head screws. This mod cut the mass by 1/3. Damn. I was hoping for some freakin' amazing results with those carbs. Just curious, but how do you tune those? Jets? Air jets? Are they possibly way out of tune? You are not the least bit curious after waiting for so long? Un stick the possibly stuck slide and let 'er rip! As for curiosity, I am for sure... but I also want to ride some and not just wrench, chasing a perfect carb set-up, not at this point in the season. well, my trusted and proven originals are back on (though I took advantage of having the carbs out to lean the pilot and mains one size (was running with fuel screws almost closed last year, and F-C screw almost full lean)). Started the old girl up and ran superbly. I still have high hopes for this set-up as in theory, there is no reason it shouldn't prove superior for the obvious reason of better atomization. Will keep you posted. 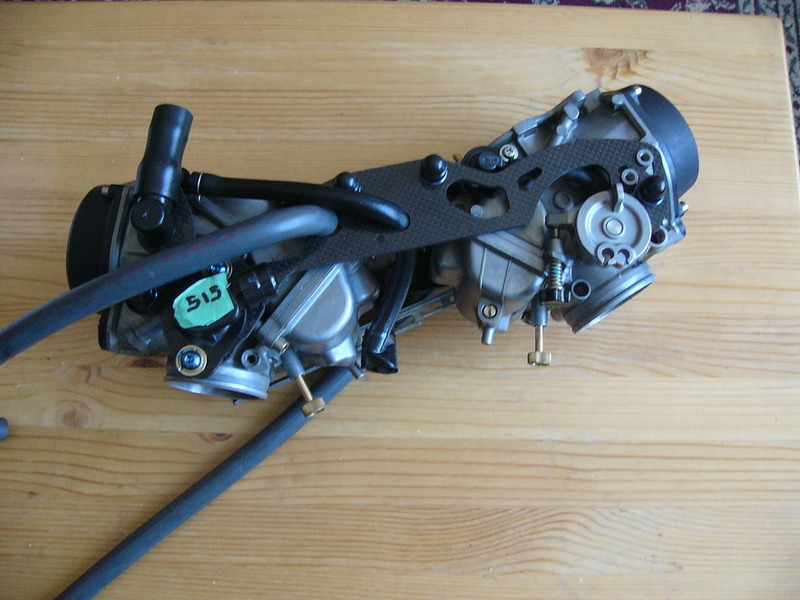 that is awesome sales support, cant wait to see these carbs dialed in with the new rotating assembly. Last edited by mikstr; 05-02-2015 at 06:57 PM.